Our patterning processing technology greatly facilitates product development by making it possible to apply dry coatings selectively to specific portions of the base material. 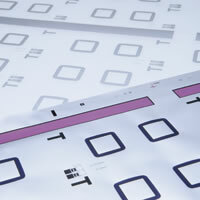 One example is See-light treatment, in which dry coating and printing are combined in a manner that allows precise reproduction of intricate patterns with an accuracy as fine as 0.1 mm. Striping treatment is a type of masking in which dry coating is used to apply stripes of any width. 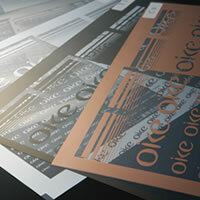 OIKE's patterning processing technology brings new freedom to the creation of decorative and functional designs and multiplies the expressive possibilities. This type of coating makes functional use of the specific properties of metals. For example, a metallic glint or electrical conductivity can be added to the metallic printed pattern based on a specified design. Aluminum vapor deposition and printing technology are combined to permit the application of complex patterns. It is possible to achieve very sophisticated design effects. 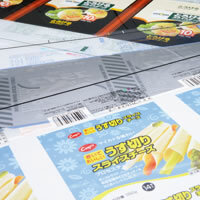 This is a type of masking that uses dry coating to apply striped patterns of virtually any variety.